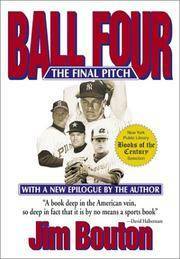 Ball Four is a book written by former Major League Baseball pitcher Jim Bouton in 1970. The book talks about Bouton's career with the New York Yankees, the Houston Astros, and primarily his season with the Seattle Pilots (the club's only year in existence). Despite its controversy at the time, with baseball commissioner Bowie Kuhn's attempts to discredit it and charging it detrimental to the sport, it is considered to be one of the most important sports books ever written. 2000-02-09. New. Ships with Tracking Number! INTERNATIONAL WORLDWIDE Shipping available. Buy with confidence, excellent customer service! 1971-06-07. New. Ships with Tracking Number! INTERNATIONAL WORLDWIDE Shipping available. Buy with confidence, excellent customer service! 1971-09-03. New. Ships with Tracking Number! INTERNATIONAL WORLDWIDE Shipping available. Buy with confidence, excellent customer service! 1993-07-04. New. Ships with Tracking Number! INTERNATIONAL WORLDWIDE Shipping available. Buy with confidence, excellent customer service! World Books, 1970. Book. Fine. Hardcover. 1st Edition. 8vo - over 7¾ - 9¾" tall. Fine Copy In Like Jacket.Stated First Printing.$6.95 on Flap.Excellent Fresh Copy of This Baseball Classic. 1971-06-07. Good. Ships with Tracking Number! INTERNATIONAL WORLDWIDE Shipping available. May not contain Access Codes or Supplements. May be ex-library. Shipping & Handling by region. Buy with confidence, excellent customer service! Dell Publishing Co., Inc, 1971-01-01. Mass Market Paperback. Used:Good. Ball Four: the Final Pitch. Norwak. : Easton Press., 2001. . Hardcover, full navy leather, raised bands, gilt decorations, all edges gilt, silk endpapers, ribbon marker. . Fine, as new in the original shrinkwrap. . 8vo.. Deluxe edition signed by the author. Condition: Fine, as new in the original shrinkwrap. Easton Press. LEATHER BOUND. B000COGY2M SIGNED Collector's Edition, full blue leather gilt. All edges gilt, lightly marked. Slightly sprung. Includes Easton Press certificate and printed "Note about Ball Four...." . Good. 1990-05-08. New. Ships with Tracking Number! INTERNATIONAL WORLDWIDE Shipping available. Buy with confidence, excellent customer service! NY: MacMillan, 1990. Book. Fine. Hardcover. Inscribed by Author(s). First Thus. 2014-05-09. New. Ships with Tracking Number! INTERNATIONAL WORLDWIDE Shipping available. Buy with confidence, excellent customer service! Bulldog Publishing. Hardcover. 097091170X New Condition *** Right Off the Shelf | Ships within 2 Business Days ~~~ Customer Service Is Our Top Priority! - Thank you for LOOKING :-) . New. Dell Pub Co, 1971-03-01. Paperback. Used:Good. CLEVELAND: WORLD PUBLISHING, 1970. Book. Very Good +. Hardcover. First Edition/First Printing. A square solid tight carefully read copy. This copy has some light browning to the edges of the text block, b oards are faded at extremities and the spine area. The 6.95 jacket has some light rubbing wear, light soil, fading in the spine area. THIS COPY IS IN MY POSSESSION AND NORMALLY SHIPS NEXT DAY. Shocking expose in it's day. He alienated more than a few team mates. Pretty funny book..
New York: Dell Publishing, 1971. Ball Four by Jim Bouton, edited by Leonard Shecter- Dell Publishing, New York- February 1971- 1st Edition-1st Printing- Softcover paperback:-12mo - over 6¾" - 7¾" Tall- As New, no jacket as issued- very minor shelf rubs, otherwise, other than opening by customers to see the printing and condition, an unread copy and Gift Quality!- SEE PHOTO- A very controversial book when it was first published- As fine a copy as can be had- Non-fiction-sports-baseball-MLB-Yankees-Bouton (4520). 1st Edition-1st Printing. Paperback. As New/No Jacket as Issued. 12mo - over 6¾" - 7¾" Tall. Norwalk, CT: The Easton Press, 2001 llector's Edition. Signed by author on Easton Press Presentation page.. Full blue leather with gilt titles and decorations; silk moire endpapers; all edges gilt; ribbon page marker. Signed Easton Press Certificate of Authenticity and blank bookplate laid in. Hardcover. Very Good/No Dj. Sports Publishing LLC, 2000-10-01. Hardcover. Used:Good. 2013-03-09. Good. Ships with Tracking Number! INTERNATIONAL WORLDWIDE Shipping available. May not contain Access Codes or Supplements. May be ex-library. Shipping & Handling by region. Buy with confidence, excellent customer service! Place_Pub: New York: Barnes & Noble Books, 1993. Reprint Edition. First Thus Printing. Hardcover. Very good/good. 400 pages. Illus., statistical appendix, some soiling and wear to DJ. Signed by the author (Bouton). Reprint of the edition originally published in 1970. This frank insider's look at baseball is a diary of Bouton's 1969 season as a pitcher with the Seattle Pilots and the Houston Astros, and a memoir of his years with the New York Yankees, Seattle Pilots, and Houston Astros. Bouton's revelations on Mickey Mantle's lifestyle and excesses spawned much of the book's notoriety. New York: A Dell Book/ Published By Dell Publishing CO., Inc., 1971. 2nd Dell Printing, March 1971 . Mass Market Paperback. Very Good. 12mo or 12° (Duodecimo): 6¾" x 7¾" tall. 370 pp. Solidly bound copy with minimal external wear, crisp pages and clean text. Slightly creased spine. Minimal crease in front cover. Bulldog Publishing. Hardcover. 097091170X Special order direct from the distributor . New. Bulldog Publishing, 2001-04-01. Revised. Hardcover. Used:Good. 2014-03-07. Good. Ships with Tracking Number! INTERNATIONAL WORLDWIDE Shipping available. May not contain Access Codes or Supplements. May be ex-library. Shipping & Handling by region. Buy with confidence, excellent customer service! 2000-02-09. Good. Ships with Tracking Number! INTERNATIONAL WORLDWIDE Shipping available. May not contain Access Codes or Supplements. May be ex-library. Shipping & Handling by region. Buy with confidence, excellent customer service! Turner, 2014. Paperback. New. 9 x 6 cm. 1971-09-03. Good. Ships with Tracking Number! INTERNATIONAL WORLDWIDE Shipping available. May not contain Access Codes or Supplements. May be ex-library. Shipping & Handling by region. Buy with confidence, excellent customer service! Turner. PAPERBACK. 1630260347 New Condition. . New. NY: World Publications. Near Fine in Very Good+ dust jacket. 1970. First Edition; First Printing. Hardcover. Blue cloth stated first printing. Cloth faintly sunned, spine head lighty softened else a square tight unmarked copy. The DJ in mylar is chipped, lightly soiled. ; 8vo 8" - 9" tall . Sports Publishing LLC. Hardcover. 1582613109 New Condition. . New. Sports Publishing LLC. Hardcover. 1582613109 Like New Condition. . Fine. U.S.A.: Barnes & Noble Books, 1993. Book. Near Fine. Hardcover. Signed by Author(s). First Thus. 1993 Barnes & Noble Books First Thus printing **SIGNED* on the half-title page and in NF/VG+ condition..
Bulldog Publishing, 2001-04-01. Hardcover. Good. 1993-07-04. Good. Ships with Tracking Number! INTERNATIONAL WORLDWIDE Shipping available. May not contain Access Codes or Supplements. May be ex-library. Shipping & Handling by region. Buy with confidence, excellent customer service! Bulldog Publishing. Hardcover. 097091170X original 1970 World Publishing hard cover - 1st edition 1st printing - some chipping to edge of dust jacket - some staining to dust jacket and page edge - minor wear to cover - otherwise binding strong contents clean - now in mylar cover - enjoy . Very Good. Champaign, IL, U.S.A.: Sports Publishing, Inc, 2000 Book. Near Fine. Hardcover. Signed by Author(s). NF in VG DJ; flat signed on flyleaf; DJ has price clipped; 12th printing. (Champaign, Illinois): Sports Publishing Inc, 2000. Hardcover. Fine/Fine. Reprint. Edited by Leonard Shechter. Large octavo. 528pp., plus (16) pp. photographs. Bottom corners a little bumped, about fine in fine dustwrapper. Inscribed by Bouton on the front free endpaper. 1990-05-08. Good. Ships with Tracking Number! INTERNATIONAL WORLDWIDE Shipping available. May not contain Access Codes or Supplements. May be ex-library. Shipping & Handling by region. Buy with confidence, excellent customer service! Bulldog Publishing. Hardcover. 097091170X Item in very good condition! Textbooks may not include supplemental items i.e. CDs, access codes etc... . Very Good. Barnes & Noble Books. SIGNED by author on half-title page. Nice clean copy. . VG+. Hardcover. reprint. 1993. U.S.A.: brilliance Audio, 2013 Audio Book. Very Good. Audio CD. 16 BRAND NEW AUDIO CDs. NEW CDS SEALED in the shrink wrap. Just a bit of shelf wear. Enjoy this NEW AUDIO CD performance GIFT QUALITY for your home and library..
Turner. PAPERBACK. 1630260347 Special order direct from the distributor . New. Sports Publishing LLC, 2000-10. Hardcover. Good. World. Used - Good. Ships from Reno, NV. Shows some signs of wear, and may have some markings on the inside. 100% Money Back Guarantee. Shipped to over one million happy customers. Your purchase benefits world literacy! World. Used - Good. Shows some signs of wear, and may have some markings on the inside.